Sanctuary: Inside Stories is a documentary film and educational DVD resource produced as part of the Sanctuary project, which aims to improve health and well-being in new communities in Scotland. 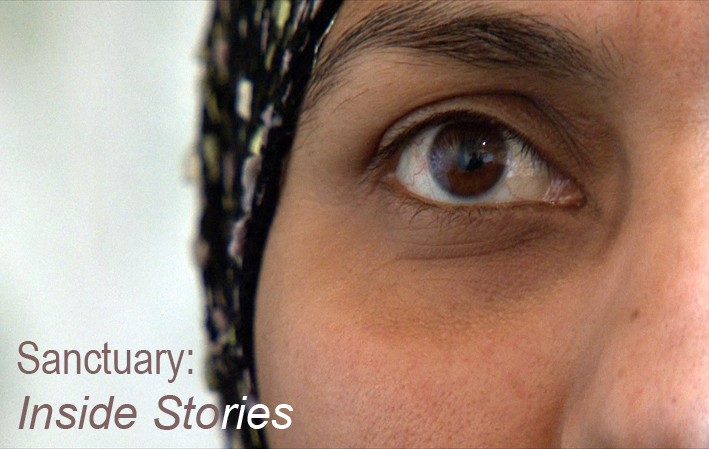 The resource gives insight into and raises awareness of the impact of asylum on mental health. 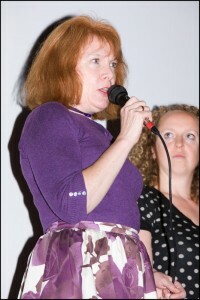 The film and DVD were launched at Refugee Week in Glasgow in June 2009 and has screened at the Scottish Mental Health Arts and Film Festival in 2009 and 2010 and Document 7 International Human Rights Documentary Film Festival, as well as several local community screenings and service user groups. 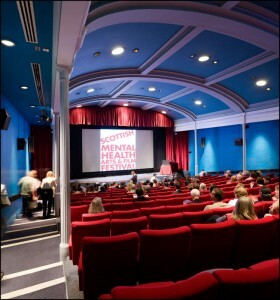 The DVD is used extensively in training by the NHS and is a unique resource which is also available online on the Mindreel site which is an initiative to unlock the educational potential of the films that have been submitted to the Scottish Mental Health Arts and Film Festival since its inception in 2007. 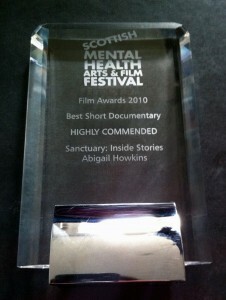 The Sanctuary project was delivered by Positive Mental Attitudes, Mental Health Foundation, Scottish Refugee Council, NHS Greater Glasgow and Clyde Equality and Diversity Team, NHS Health Scotland, Medical Foundation for Victims of Torture and Compass, the specialist NHS mental health team working with asylum seekers and refugees. 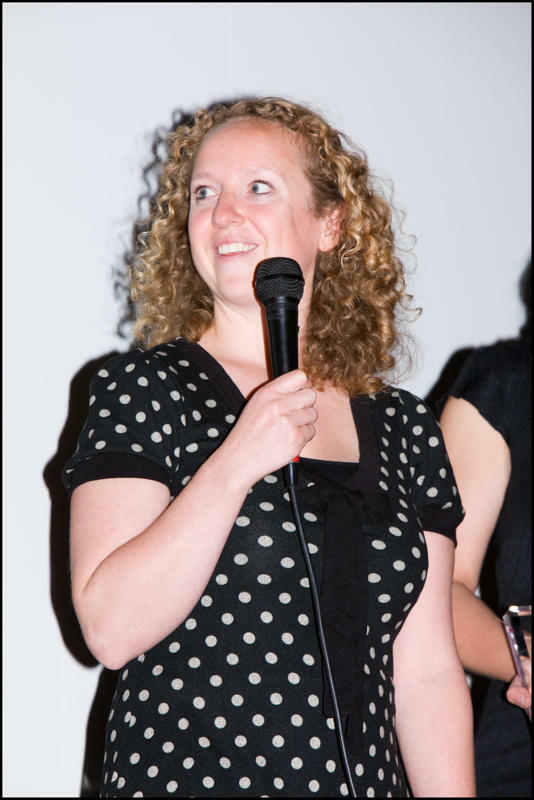 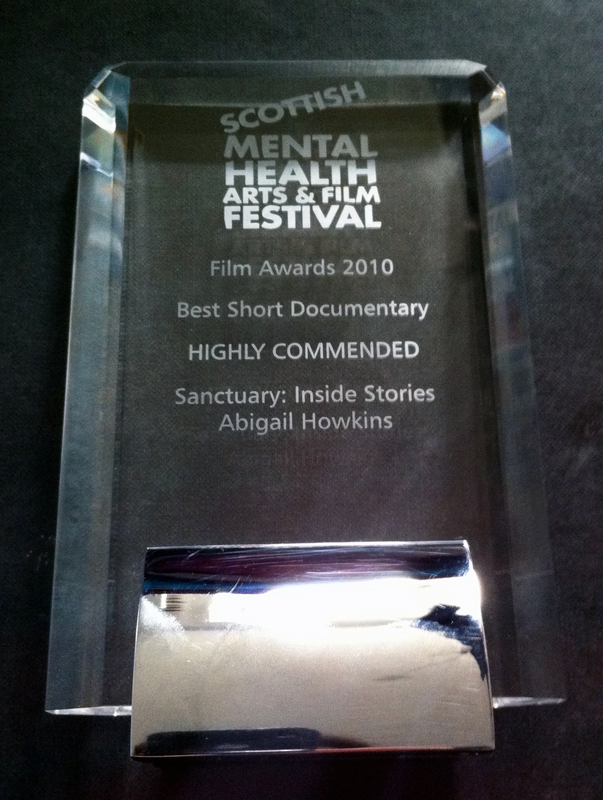 Sanctuary: Inside Stories was directed and produced by Abigail Howkins for Diversity Films. For further information about the Sanctuary project, please contact Positive Mental Attitudes. 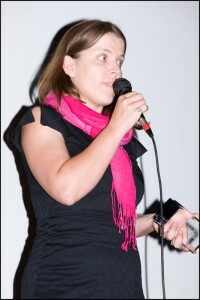 Edinburgh Filmhouse, SMHAFF 2010, Abigail Howkins, Alison Davis (Community InfoSource) and Elise Marshall (Medical Foundation for Victims of Torture) collect the award on behalf of the contributors.